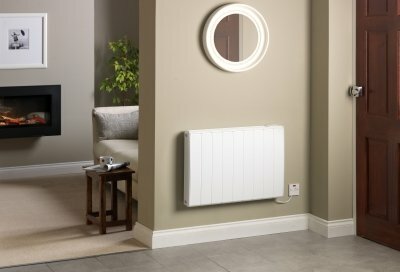 Taking design cues from the leading Dimplex Quantum heater, the Q-Rad200 is sleek, slim and stylish combining good looks with simple controls and it boasts a range of unique, intelligent features which work automatically to help keep you warm for less. The Q-Rad200 combines the latest, most advanced technologies to give you maximum control over your heating, allowing you to choose when you want heat and at what temperature using the intuitive heater control. A low thermal mass allows Q-Rad to heat up quickly and react more responsively to changes in room temperature. This means improved control, comfort and energy saving. The QRad 200 has a convective element and a radiant element. It uses one or both heat sources automatically to maintain an accurate target room temperature. It calculates the time needed to heat a room, with both the convective and radiant element beginning by operating at full power. As the room approaches the target temperature, Q-Rad begins to cycle the convective element between full and reduced power until the target temperature is reached. At this point this switches off the convector avoiding overshooting and saving you energy. To maintain the target temperature, it cycles the convective and radiant elements on and off as required. 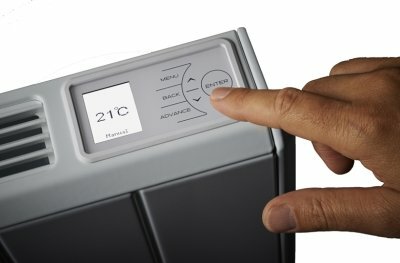 The Q-Rad 200 has a unique self-learning delayed start function, which learns the thermal characteristics of a room and determines how long the appliance needs to operate in order to reach target temperatures based on factors such as room size, heat losses and the prevailing weather. 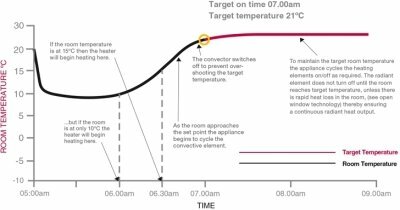 Measuring the heat-up and cool-down times of the room, and how they vary with external temperature, the heater will work out what time it needs to start heating in order to reach the user-defined target temperature at a specified time. Inevitably, this minimises wasted energy and can deliver cost savings for users e.g. 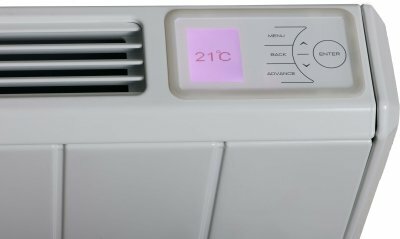 If you plan to get up at 7am and your desired temperature is 21oC: with a traditional system, you would need to estimate when to set the heating to come on to ensure it preheats the room in time. Depending on your settings and prevailing temperatures, this could mean that the room is still cold when you get out of bed or that it has been warm for some time before it needed to be. However, with this clever feature, Q-Rad anticipates when it needs to start heating to reach 21oC by 7am, pre-heating for shorter periods when the weather is mild and longer periods to ensure you're warm in the winter. The Dimplex QRad200 comes with 4 pre-programmed timer modes: Out All Day, Home All Day, Holiday and Use Timer. The times of these may be modified to suit your lifestyle, plus there's a handy Advance function that lets you change your settings temporarily. Should a window or door be left open accidentally, it will detect a sudden change in temperature and scale back the output to 50%. Once the window or door has been closed, Q Rad 200 will return to normal operation. This technology ensures the output from the heater is reduced when heat is escaping from a room, thereby avoiding wastage and saving you money. Exactly what it says 'on the tin'. Heaters were well specified on the site, delivered on time, are now installed and warming the rooms nicely. Great Service - I have alreday recommended to a friend. Ordered, delivered and now installed - on time, as promised and at a great price - thank you. Thank you very much for your recommendation and brilliant review of our service and delivery. We appreciate you taking the time to give us such fantastic feedback. Very competitive on price and items were perfect. Quick delivery too. Thank you very much for taking the time to review our service and pricing as excellent, it is very much appreciated. Thank you for the really great feedback of our service and quick delivery. Great product and service. Fantastic website and delivery time. Great products and service. Easy website with super fast delivery. Thank you very much for the great feedback of our service and our fantastic free next day delivery, it is very much appreciated. Thank you very much for your really brilliant feedback of our service and information on our products. We try our very best to ensure that our customers have all the information needed and offer heat loss calculations and expert advice to make sure that you get the right heater for the job. Very happy with my purchase. My flat is lovely and warm now and they look so much better than storage heaters. Quick delivery, efficient service, competitive prices. Brilliant to hear, thank you very much for the fantastic review and recommendation. Excellent product, suitably packed and with comprehensive fitting and usage instructions. Just as described. First class in every aspect! Faultless service.! First class in every aspect from telephone queries to email responses and quotes..and very competitive prices throughout! My goods dispatched to my requirements without problem and linked up coordination with the carrier made my job so much easier. Thank you very much for the really great review of our service , we aprecaite the fantastic positive feedback. The heaters were delivered very quickly without any concerns. They have been installed and are exactly what it says on the tin. User friendly keep the place toasty. Very happy with my choice. That is really fantastic to hear, thank you very much for taking the time to leave such great feedback. So far excellent.Takes up very little space and seems to be what we need. A very good product.Instructions hard to follow. Thank you very much for your really fantastic review. 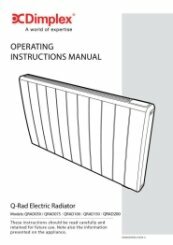 Please call us on 01473 276686 and we will be more than happy to help you with the instructions and the operation of your Dimplex Q-Rad electric radiator. Brilliant to hear, thank you for the feedback. Smart looking, good controls, easy to wire up. No trouble, seen what I wanted,purchased and delivered as quote. A good service. Thank you very much for the great review. If you need any further assistance, please do not hesitate to contact us again. That is great, thank you for the 5 star product review. Thank you for the great feedback of our service and competitive prices, we appreciate your fantastic and positive comments very much. Very responsive to emails, delivery was exactly when they said it would be, the item arrived in good condition and as described, I would happily use this company again. Brilliant, thank you for the fantastic feedback of our service and delivery. Brilliant, thank you for the great service review. very fast delivery. good service. Thank you for the excellent review of our delivery service. Our FREE next day delivery is a really great service that we are proud to be able to offer our customers. Same comments as before. Highly recommend. The best customer service team I have ever dealt with ! Speedy delivery. Updates on your purchase. Even collection was spot on. Will certainly recommend to friends and family. Thank you very much for taking the time to review us as excellent and for the recommendations, it is very much appreciated. Brilliant, thank you for the great review and we very much look forward to hearing from you again soon! Would be 5 star if Dimplex extended warranty to 5 years +. 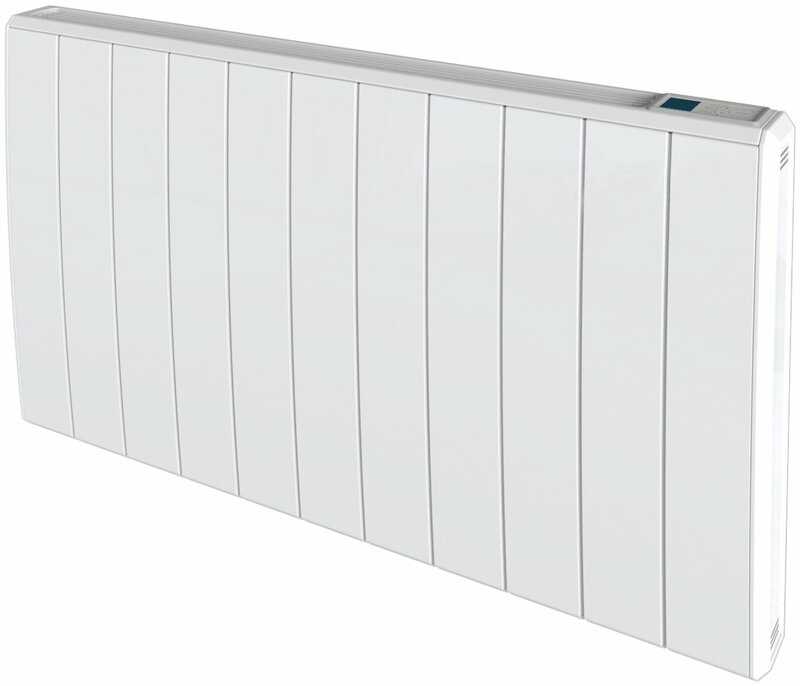 There are no moving parts and it is a simple combination of convector & panel heaters. (longstanding technology) . 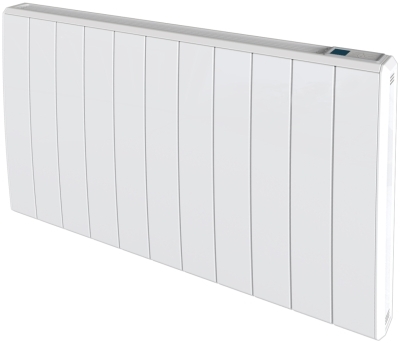 I have £30 convectors which are 10 + years old,so the price of above is not justifiable without longer warranty. Easy to order purchase by phone. There are number of rogues on internet charging rip off prices.Hope you will be able to wipe them out. Thank you for the brilliant feedback of our service and great packaging, we appreciate your comments. 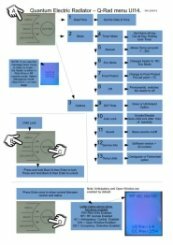 Love this rad so easy to use and program! Great experience, next day delivery is really good. Really good communication would definitely shop here again! Thank you very much for the really fantastic comments and great feedback of our service. Looks good and fingers crossed will be more economical than nsh. Heater shop were very helpful every step of the way. Delivery was quicker than expected and price was best we could find! That is great to hear, thank you for the fantastic review. Still trying out different options, so far so good. Will know more when electric bill comes in. I would highly recommend using the heater shop. Very prompt delivery, will use again in the future. ﻿Thank you very much for taking the time to review us as excellent, we appreciate the great feedback. Easy and straight forward ordering with prompt delivery. Happy product. ﻿That is really fantastic to hear, thank you very much for taking the time to review our service as excellent. 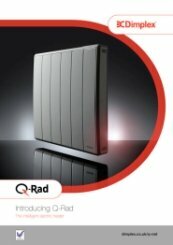 That is fantastic, thank you very much for rating your new Dimplex Q-Rad electric radiators so highly. Our priority is always to ensure that we give the very best advice and service to all of our customers. 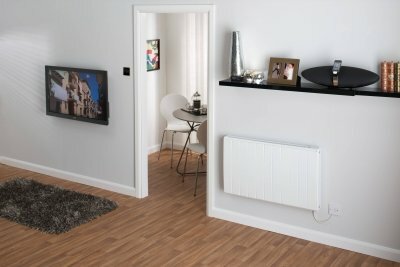 Brilliant, thank you for your great review of the Dimplex Q-Rad electric radiator. 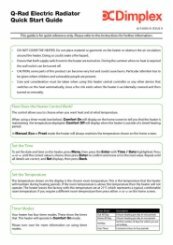 Website easy to use on heater is awesome. Heater works really well and is easily programmed. Fantastic, thank you very much for your excellent review. Very good level of heat produced, this was bought for a tenanted property, the family are well impressed with this & it was easy to fit, brackets were also strong enough for the heater, not always the case for everyday use. Electric heater arrived when stated & was packaged well, the information given was clear & setting it up was easy, decent strong brackets supplied with heater also. The heater was bought for a rental property & the tenant is very happy with the heat produced, especially with the current weather, the flat is now fully warm again. Thank you for your 5-star rating for both service and product. 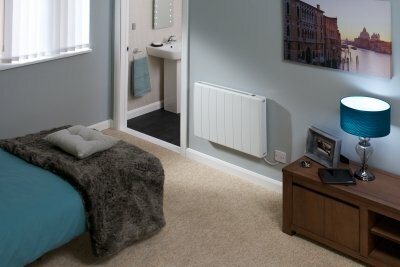 We appreciate your fantastic feedback for the Dimplex Q-Rad electric radiator - this really helps potential customers. Early days but does the job well. Looks good and so far seems far more efficient than the old storage heater it replaced. Very pleased. Good price, good comes, speedy delivery! Informative website, quick delivery, good communication. Just what on line purchasing should be like. Early days but product seems good and as described. This was the cheapest I could find this product, so overall very pleased with the whole experience. We do try very hard to ensure that we go the extra mile for all of our customers. If you need any future assistance, please do not hesitate to contact us on 01473 276686. Looks good and seems to be working well at the moment. It would be good if the heater came with a plug already fitted for ease of use. Easy to order online, great customer support, prompt delivery and quality item. Well done Heater Shop! Thank you for taking the time to review the Dimplex Q-Rad electric radiator as excellent and for your fantastic comments on our service, we very much appreciate it. Kept me informaed of delevery progress and arrival time. 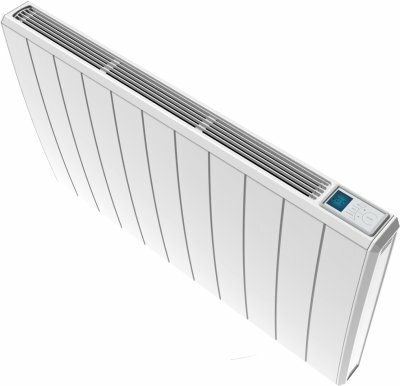 Fantastic, thank you very much for your review of the Q-Rad Electric radiator and our service. very happy with heater shop. kept me updated on the delivery times and arrived on time. fantastic product, so controllable and looks good as well. replaced old night store heaters with these and very pleased I did. Brilliant . Very warm .Sleek and modern . Highly recommend . 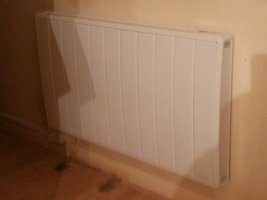 Thank you for uploading the picture of your new Dimplex Q-Rad electric radiator - it looks great! Fantastic service . Updated me on everything . Prompt delivery . Highly recommend . Thank you for your feedback and great comments regarding our service.